A second study in the journal, involving University of Bristol researchers, also suggests that there could be a window of opportunity during childhood to reduce the risk of poor lung function in later life. In the first study, 2,438 participants from the Tasmanian Longitudinal Health Study (Australia) were tracked from childhood to the age of 53 – making it the largest and longest-running study of its kind. Lung function was measured at the ages of seven, 13, 18, 45, 50 and 53 years old, and participants’ exposure to various risk factors was also recorded. The authors identified six distinct pathways describing how lung function changes with age. Three of these pathways were associated with COPD – the group with below average lung function in early life and a quick decline in lung function in later life, those with persistently low lung function, and those with below average lung function. Combined, these three pathways were linked to an estimated three-quarters of all cases of COPD occurring at the age of 53 (75.2 per cent overall). For moderate-to-severe COPD, all cases only arose from these three trajectories. In the second study, using data from the Avon Longitudinal Study of Parents and Children (ALSPAC), also known as Children of the 90s, 2,632 participants were tracked from birth to 24 years old and their lung function was measured. The authors found that around three-quarters of infants aged one to six months with poor lung function improved throughout their childhood, indicating a window of opportunity to increase lung function and potentially reduce risk of COPD in later life. They suggest that interventions to maximise lung growth in early childhood might modify the risk of COPD in older age. 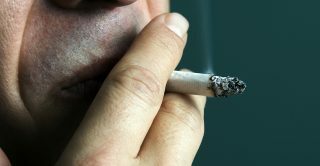 The first study was funded by National Health and Medical Research Council of Australia, European Union’s Horizon 2020, The University of Melbourne, Clifford Craig Medical Research Trust of Tasmania, The Victorian, Queensland & Tasmanian Asthma Foundations, The Royal Hobart Hospital, Helen MacPherson Smith Trust, and GlaxoSmithKline. It was conducted by researchers from The University of Melbourne, National Institute of Fundamental Studies, University of Tasmania, The Alfred Hospital, Monash Health, Monash University, Flinders University, Sir Charles Gairdner Hospital, University of New South Wales, Imperial College London, University of Bergen, Royal Brisbane and Women’s Hospital, University of Queensland, Gold Coast Hospital, Cancer Council Victoria. The second study had no funding, and was conducted by researchers from Imperial College London, Bristol Medical School, University of Bristol, University of Aberdeen, University of Manchester, Manchester Academic Health Science Centre, University of Western Australia. A group with below average lung function in early age and a quick decline in function in later life (4%, 97/2438 people), persistently low lung function (6%, 136/2438 people), a group with low lung function in early age followed by rapid improvement and normal decline in function later in life (8%, 196/2438 people), persistently high lung function (12%, 293/2438 people), below average lung function (32%, 772/2438 people) and average lung function (39%, 944/2438 people).